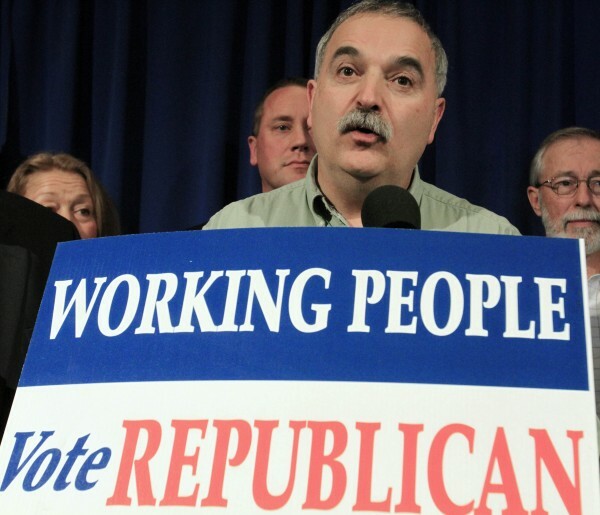 Charles Webster, chairman of the Maine Republican Party, attends a rally at the State House in Augusta, Maine, on Wednesday, Nov. 3, 2010. Republicans celebrated their victories at the polls by winning the governorship and both houses of the Legislature. This is the first time in more than 50 years that the Republican party has gained control. AUGUSTA, Maine — Maine Republican Party Chairman Charlie Webster on Monday called for an investigation into the voting records of more than 200 college students who he believes committed voter fraud during the 2010 election. Webster hand-delivered to the Secretary of State’s Office a list with 206 redacted names — all out-of-state students attending public Maine universities last year — and urged the office to determine whether those students voted legally. “I am convinced that my research proves that [voter] fraud is a problem, and I’ve only found the tip of the iceberg,” Webster said Monday during a press conference at the State House. Specifically, Webster questioned whether those students had established residency in Maine or whether they voted twice — in Maine and in their home state. The names were not provided to the media on Monday, only hometowns and years of birth. Webster said if he had access to enrollment data for the state’s private colleges, such as Bates, Bowdoin and Colby, he believes the list of potential violators would be in the thousands. Shortly after receiving the list from Webster, Caitlin Chamberlain, a spokeswoman for the Secretary of State, said her office would conduct a thorough investigation based on the seriousness of the allegations. Critics said Webster provided no evidence of any wrong-doing by any students. Rep. Mike Carey, D-Lewiston, who attended Webster’s press conference, also said Webster’s continued search for evidence of fraud contradicts what Secretary of State Charlie Summers has said in the past: Maine elections are well run and instances of fraud are scarce. Carey further criticized Webster for failing to provide any further details such as: How many of the 206 students named actually voted twice? How many of them registered in Maine on Election Day? How many officially declared primary residency in Maine? Asked for those specifics, Webster said that he did not have the resources to get that data. “I only dealt with what was the easiest thing to find,” the GOP chairman said. Webster said he began researching recent voter fraud a few weeks ago after a broad-based coalition of advocacy groups launched a petition drive in an attempt to overturn a new law that bans voter registration on Election Day. The Republican-led Legislature passed a law in June that reversed the 38-year-old Maine practice of allowing same-day voter registration. The change was initiated to bring integrity to the election process and alleviate stress on municipal clerks, according to supporters. Shortly after the law passed, petitioners began the process of gathering more than 57,000 signatures to force a statewide vote in hopes of reinstating Election Day registration. David Farmer, a spokesman for Protect Maine Votes, the coalition leading the repeal effort, said volunteers had another strong weekend and were hopeful that a question would appear on the November ballot. Webster did not specifically reference Election Day voter registration at his press conference on Monday, but spoke more generally about the problems he sees with Maine’s voting system. The GOP chairman said he personally has witnessed what he called “poll flooding” by special interest groups. Asked to name those groups, Webster listed MoveOn.org, ACORN and, “obviously, the Democrat party has a plan to do that too,” he said. So, is Maine’s Democratic Party a special interest? Those comments elicited laughs from some Democrats who attended the press conference, but Rep. Carey said he wasn’t surprised. Webster admitted that he only investigated out-of-state students for possible cases of voter fraud, not actual cases, and he was not specific about what types of fraud took place. In the past, the Maine Supreme Judicial Court has ruled that students can consider a college dormitory their primary residence, which would allow them to vote in that community even if they are not full-time Maine residents. Some Democrats chastised Webster for specifically trying to suppress the voting rights of college students, a bloc that traditionally votes Democrat. According to Orono Town Clerk Wanda Thomas, of the 2,947 University of Maine students who registered on Election Day, 907 registered as Democrats, 446 as Republicans, 209 as Green Independents and 1,385 were unenrolled, meaning they did not register with a political party. Even a member of his own party, Assistant House Majority Leader Andre Cushing of Hampden, on Monday referred to Webster’s recent findings as “anecdotal evidence.” Cushing said he would wait for the Secretary of State to investigate further before he made additional comments. Evert Fowle, district attorney for Kennebec County, said in his opinion Maine’s elections are honest and well-run. “My office aggressively prosecutes violations of the law,” he said. “We have never had any suggestion made to us that the Election Day registration of voters has led to the commission of any criminal acts.